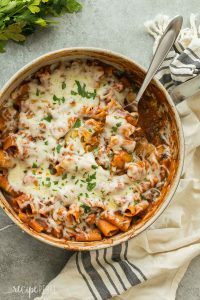 This One Pot Baked Ziti with Italian Sausage is full of flavor but easy on the dishes! It’s made with turkey Italian sausage, spinach, tomato sauce and loaded with cheese — the perfect weeknight dinner! Includes step by step recipe video. 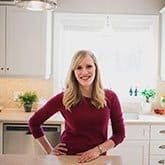 So, I was a little flabbergasted last fall when this Slow Cooker Baked Ziti blew up the internet. 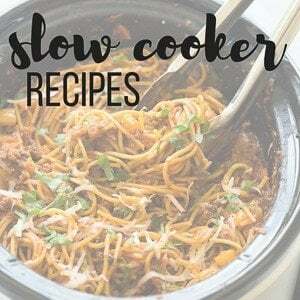 If I had known that you love a good slow cooker pasta as much as I do (this Slow Cooker BBQ Chicken Chili Mac and Slow Cooker Hamburger Helper are two of my other favorites! ), I would have done it long before. 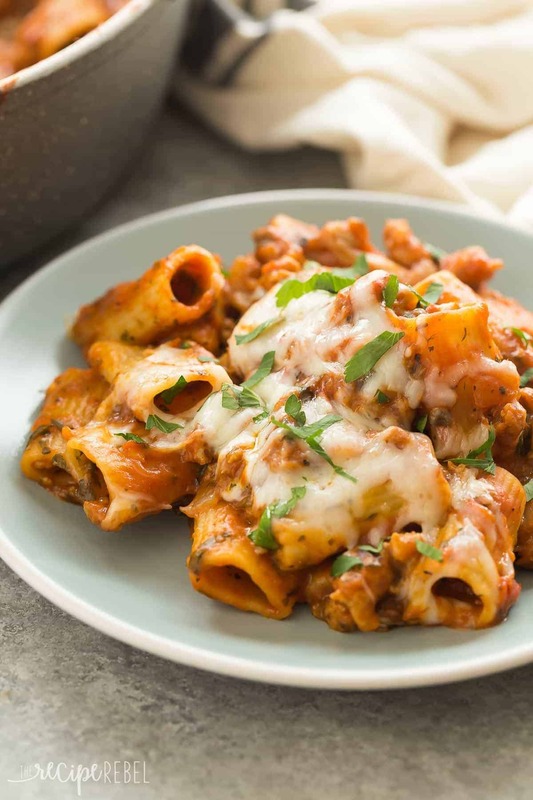 I’ll have to admit, I figured that there would be immediate backlash because (a) it’s not baked, and (b) I didn’t even use ziti, but you guys seemed to forgive and go for it just because it’s a super easy, nutritious weeknight meal. Around here, “weeknight meals” are about all we can manage. And so I’m BACK. With another not-actually-baked-not-actually-ziti baked ziti recipe. It has only taken me about a year, which is probably about average for how long it takes me to catch on to what you actually want to see here. For this version, I wanted to keep things simple and bump up the flavor, lose a few calories, and a pot or two. 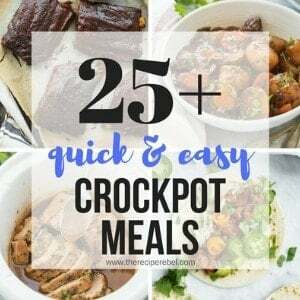 Since it’s 30 Minute Thursday here, we’re getting it done in one pot with no waiting (okay, hardly any!). 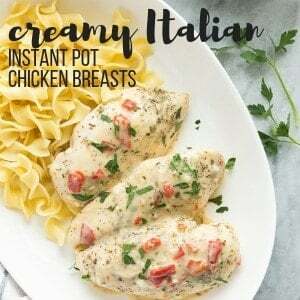 Love one pot pastas? Try this One Pot Chicken Chow Mein! For this recipe, I used turkey Italian sausage instead of beef, I used crushed tomatoes and a whole whack of spices instead of jarred tomato sauce (although I won’t judge you if that’s all you have), I added some spinach (yay for sneaky greens! ), and I used Rigatoni instead of Penne to try to trick you into believing I could actually find ziti around here (still — I cannot). This is a meal we could eat over and over again, and I don’t even have to bribe my children to eat it. For me, that’s a big win! Plus, we all hate dishes, don’t we?? 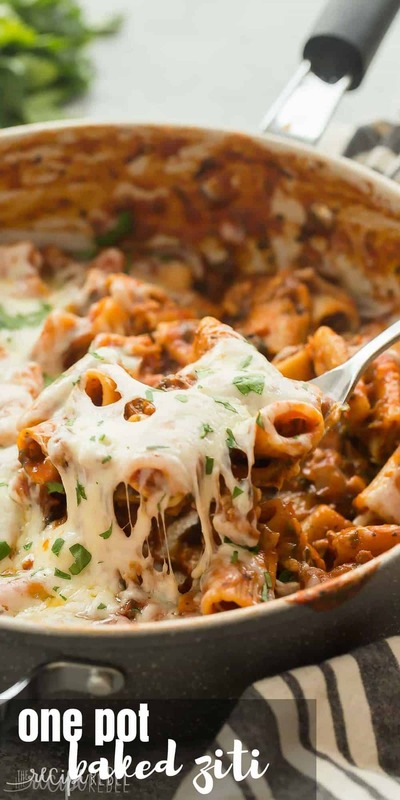 This One Pot Baked Ziti with Italian Sausage is full of flavor but easy on the dishes! It's made with turkey Italian sausage, spinach, tomato sauce and loaded with cheese -- the perfect weeknight dinner! Includes step by step recipe video. Remove turkey sausage from casings and fry in large skillet over medium-high heat until crumbled and brown, about 2-3 minutes. Add onion and garlic and cook until softened, about 2 minutes. Add spinach, red pepper flakes, salt, parsley, oregano, basil, tomatoes and broth and stir until combined. Stir in the pasta. Bring to a simmer, reduce heat to medium and cover. Cook, stirring often, until pasta is tender, about 12-15 minutes (smaller pasta will take less time). Top with cheese, cover and let sit until cheese is melted. Serve. *If you're using a smaller pasta, you'll want to go by the weight amount and not the volume. *If you’re using a smaller pasta, you’ll want to go by the weight amount and not the volume. More 30 minute meals for this crazy season! Silly question, but when you say 5 cups pasta, is that uncooked or cooked? I’m assuming uncooked. This looks like something I could make after a 12 hour day before I completely collapse on the couch. Possibly tomorrow if I have everything. ?? I haven’t been able to find Italian Turkey sausages in grocery stores in Vancouver (very little turkey sausage even). Would plan chicken/turkey sausage combined with a couple of tablespoons of Italian seasoning work instead? You could do that, or you could use pork Italian sausages. It will have the same flavour but a little higher in calorie. I need more one pot meals like this! This meal would disappear in no time at our house! I’m all for un-baked, baked ziti! This looks super cozy and perfect for Fall!